Texas Gov. Greg Abbott (R) issued four emergency actions related to CPS, sanctuary cities, ethics reform and less federal intervention. Abbott issued a proposal making it a hate crime for anyone to commit a crime against a law enforcement officer out of bias against police. The biennial Muslim Day rally held outside the capitol ended with no interruptions and only a few protesters. Texas Gov. Greg Abbott (R) delivered his State of the State address in the House chamber of the Texas Capitol Tuesday morning, telling lawmakers to get to work on better funding the state's beleaguered child welfare system and banning so-called "sanctuary cities." Abbott used his second State of the State address to echo President Donald Trump's executive actions that would withhold taxpayer funding to local governments that don't comply with federal immigration agents. But Abbott wasn't specific about what a Texas anti-sanctuary law should look like. The governor, who doesn't have the power to remove local officials, has threatened the job of the Travis County sheriff over her "sanctuary cities" polices. Abbott has ordered Sheriff Sally Hernandez to enforce the immigration holds or risk losing funding. Tackling child welfare, the governor said the state's child welfare crisis has resulted in rising deaths and hundreds of allegedly abused or mistreated children going unseen by state investigators. The problem has worsened despite Abbott ordering an overhaul last year. Abbott is also calling for a review of the state's school finance system that the Texas Supreme Court ruled was only barely constitutional last summer. Abbott also called for school vouchers, an effort that has stalled repeatedly in Texas Legislature despite steadfast support from top conservatives. The governor issued a proposal that would make "it a hate crime for anyone to commit a crime against a law enforcement officer out of bias against the police" and he's asking that legislators pass the Police Protection Act this session. "While our state and the nation continue to mourn the heroes lost in Dallas, it is time for us to unite as Texans to say no more," Abbott said in a prepared statement. "The men and women in uniform risk their lives every day to protect the public, and it is time we show them the State of Texas has their back. Texas will no longer tolerate disrespect for those who serve, and it must be made clear to anyone targeting our law enforcement officials that their actions will be met with severe justice." 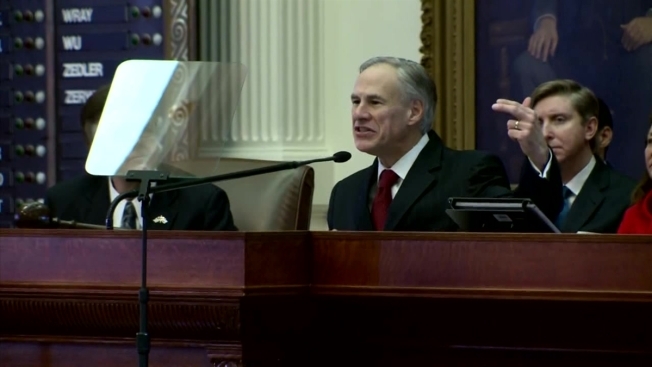 In his address, Abbott also listed property tax reduction, expanded school choice options, expanded Pre-K and improving adoption and protecting the unborn as legislative priorities for the session. Abbott's address to the Republican-controlled Legislature comes at a time when President Donald Trump's executive actions on immigration and building a border wall promise to heavily impact Texas. Hundreds of Muslims rallied outside the Texas Capitol before the governor's speech as part of a lobbying event organized months before Trump's executive order Friday. Abbott hasn't yet commented on Trump banning immigrants from seven Muslim-majority countries, which has sparked protests nationwide. By 10 a.m., several hundred people had gathered outside the Texas Capitol for the Muslim Day rally and lobbying activities. Supporters wore T-shirts on a sunny and brisk Tuesday morning saying, "I stand with my Muslim neighbors." Only a single counter protester was seen in the early going, and there were no signs of tense interactions with rally participants. A group of North Texans planning to take part in the rally boarded a bus Tuesday morning in Plano bound for the capitol. Two years ago, a small, vitriolic group of hecklers formed during the Muslim Day rally. Before it started, one grabbed the microphone and proclaimed, "Islam will never dominate the United States!" This year, security has been increased and rally participants surrounded the microphone and nearby areas to keep something similar from happening. Many of the people formed a human chain around the few protesters who did show up to keep them at a distance. Supporters of the demonstrators waived signs that read "Hate Has No Home Here." By 12:30 p.m., the rally had ended with few protesters and no interruptions. The biennial event organized by The Council on American-Islamic Relations was scheduled before Trump won the presidency, but tensions have risen after Trump banned entries to the U.S. from seven Muslim-majority nations.